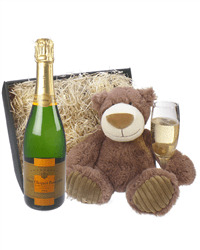 Have you seen this adorable teddy bear and bottle of Champagne gift? This Champagne gift basket makes an excellent choice to send to celebrate the birth of a child or for an occasion where you want a keepsake. 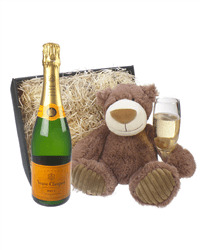 Choose Brut, Rose or Vintage Veuve Clicquot Champagne from our selection of Veuve Clicquot Champagne and Teddy Bear gift baskets and we will send it with a charming cuddly bear, beautifully presented with your special gift message.